Thanks to your support over the past two months, FAME has helped the Kangaroo Island (KI) Land for Wildlife program engage with 48 landholders and gain access to over 11,000 hectares of western KI potential Kangaroo Island Dunnart habitat for survey work. Over 2,500 surveys nights have been completed across 2,174 hectares. 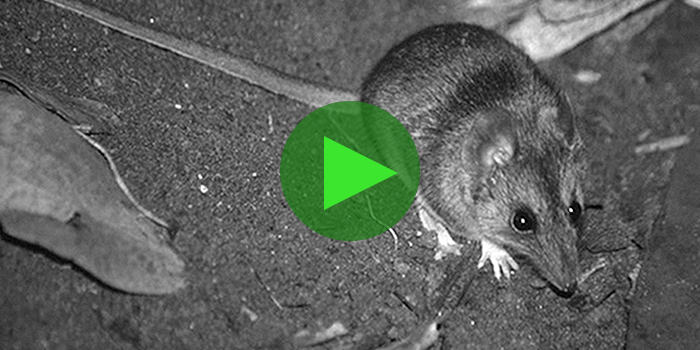 To date, three recordings of the Kangaroo Island Dunnart have now been confirmed. The surveys have continued to record a number of significant and threatened species including the Kangaroo Island Echidna, Western Pygmy Possum, Southern Brown Bandicoot, Bassian Thrush, Shy Heath Wren and the Rosenberg’s Goanna. Pitfall and Elliot trapping at the identified Kangaroo Island Dunnart sites will commence once the spring weather arrives. Video above: The array of Kangaroo Island wildlife captured on camera, and a few taunting feral cats. How many Kangaroo Island Dunnarts can you count? Email us with your answer.